My recent obsession has been sweet potatoes. Candied sweet potatoes to be exact. Dessert and a side dish all in one. I’ve made this recipe for Twice Baked Candied Sweet Potatoes over a handful of times in the past 2 weeks. It all stemmed from wanting candied sweet potato casserole. 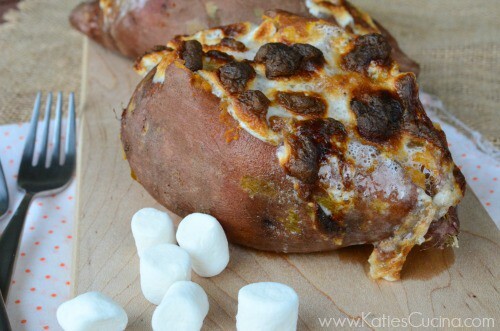 That’s when I got the genius idea to make a twice baked candied sweet potato. When I’m hungry–I’m starving and I want food ASAP. So I’ve been doing everything in my power to get food on the table and in my belly as quickly as possibly. I can whip up two of these twice baked candied sweet potatoes in just 15 minutes. They aren’t the prettiest of food to look at, but they are darn tasty. And that is all that really matters, right? Granted, I cheat a little. I use the microwave for a little help. You don’t have to do that if you don’t want too. You can bake them in the oven the traditional way. Or you can get these bad boys on the table as quick as possibly like I’m teaching you today. My mom thinks I’m crazy for making a candied version, and keeps reminding me I have a glucose test to take in the next few weeks. Mom, it’s ok. It’s not like I’m eating 10 of these in one sitting (just maybe 2). I was tempted to make these for Thanksgiving but went the traditional route with a casserole instead (I’ll share that recipe later this month). These make for a great snack (in my case) or a quick and easy side dish for twice baked candied sweet potatoes. Oh and if you’re wondering if I ate both of these after the photo shoot… no. I ate one and wrapped the other one up and ate it a day later! Not as good a day later, but when you’re instantly hungry, what else is a girl supposed to do? Wash sweet potatoes really well. Poke with a fork, wrap in a damp paper towel and microwave for 5-7 minutes until cooked through and soft (time may vary depending on the microwave). While sweet potatoes are cooking, in a small bowl mix together the brown sugar, cinnamon, and dash of nutmeg. Set to the side. Preheat broiler in the oven. Once the sweet potatoes are done cooking, melt 1 tablespoon of butter in the microwave. Carefully open up the sweet potatoes (I like to use a fork and poke holes and gently open the potato). Divide the cinnamon sugar mixture between the two potatoes and mix well inside the sweet potato. 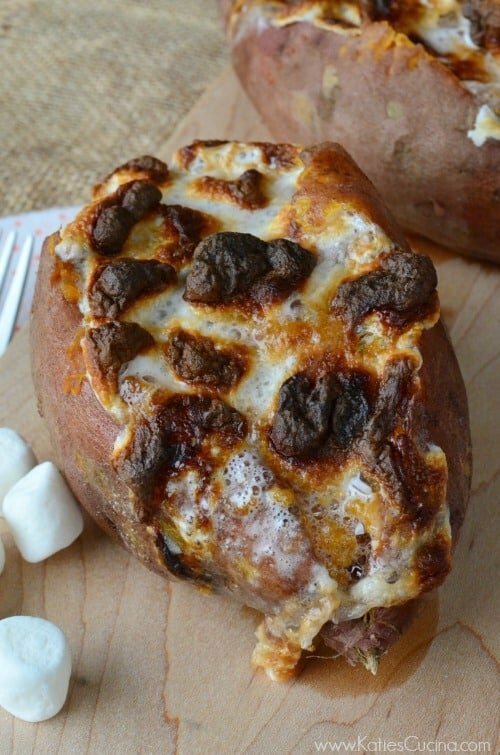 Add a handful of mini marshmallows to each potato and then drizzle with melted butter. Broil for 1-2 minutes until the marshmallows are toasted. Yum is almost all I can even muster! 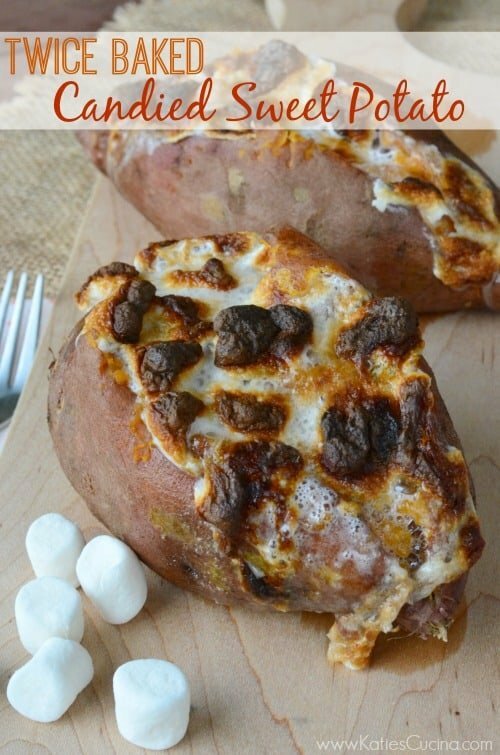 I love twice baked sweet potatoes! Love this easy microwave version! Me too–I’m all for easy!